Silkworms are the caterpillars of moth species raised for silk. 90% of the world production results from the cocoons of the domesticated mulberry silkmoth Bombyx mori, a Bombycidae moth. Silk is also produced from other domesticated or wild Saturniidae moth species, notably the Eri silkmoth Samia cynthia ricini, the Assam silkmoth Antheraea assamensis, the tussore (or tussah) moth Antheraea mylitta and the small tussore Antheraea paphia (Longvah et al., 2011; Mishra et al., 2003). When the silkworm enters the pupa phase, it builds a protective cocoon made of raw silk. At the end of pupation, the pupa releases an enzyme that creates a hole in the cocoon and the moth emerges. In order to produce silk, the pupae are killed by boiling, drying or soaking in NaOH before they produce the enzyme (Datta, 2007; Jintasataporn, 2012). The spent pupae are produced in large quantities and are a major by-product of silk production (Datta, 2007). For 1 kg of raw silk, 8 kg of wet pupae (2 kg of dry pupae) are produced (Patil et al., 2013). Spent silkworm pupae are a waste material often discarded in the open environment or used as fertilizer (Wei ZhaoJun et al., 2009). It can be extracted to yield valuable oil used in industrial products such as paints, varnishes, pharmaceuticals, soaps, candles, plastic and bio-fuels (Trivedy et al., 2008). The extracted meal is sometimes used for the production of chitin, the long-chain polymer of N-acetylglucosamine which is the main component of the exoskeleton (Suresh et al., 2012). Silkworm pupae have long been eaten by humans in Asian silk-producing countries, and are considered as a delicacy in regions of China (Luo Zhi-Yi, 1997), Japan (Mitsuhashi, 1997), Thailand (Yhoung-Aree et al., 1997), India (Longvah et al., 2011), and elsewhere. Due to its high protein content, silkworm pupae meal has been found suitable as a livestock feed, notably for monogastric species (poultry, pigs and fish), but also for ruminants (Trivedy et al., 2008). Fresh spent silkworm pupae spoil rapidly due to their high water content, therefore spent pupae are generally sun-dried and ground (Usub et al., 2008; Wijayasinghe et al., 1977; Jintasataporn, 2012). The degradation of mulberry-fed silkworm pupae produces a foul smell that has been attributed to the presence in mulberry leaves of compounds that might be sequestered by silkworms, including essential oils, flavenoids and terpenoids. This bad odour has been linked to palatability issues (Rao, 1994; Finke, 2002). Defatted silkworm pupae meal is less perishable and has a higher protein content than undefatted meal (Blair, 2008). Ensiling also increases the shelf life of silkworm pupae meal and good quality silage has been obtained when ensiling with molasses, propionic acid or curd (Yashoda et al., 2008; Rangacharyulu et al., 2003). Spent silkworm pupae should be ground to assure more uniform mixing in rations (Göhl, 1982). Silkworm litter (or silkworm dregs), another by-product of silkworm rearing, is a mixture of excreta (the digestibility of mulberry leaves is about 55%; Patil et al., 2013), sloughs (moulting residues) and mulberry leaves (Chen YaoWang, 1989). The world production of silkworm cocoons suitable for reeling was about 485,000 tons in 2011. By subtracting the amount of raw silk (161,000 t), it can be assumed that 324,000 tons of fresh pupae (65,000 t dry) were produced in 2011 (FAO, 2012). However, these FAO estimates are much lower than the official statistics from China, where a figure of 440,000 t of dry pupae produced in 2009 has been cited (Wei ZhaoJun et al., 2009). The main silk producers are China, India, Uzbekistan, Brazil, Thailand and Vietnam (FAO, 2012). Spent silkworm pupae are a fresh, highly degradable product. In silk producing areas, the disposal of large quantities of pupae can cause serious environmental problems (Wang Jun et al., 2010). The utilization of this resource for feed and food or for the production of valuable biological substances such as chitin, protein, oil and fatty acids (α-linolenic acid) is a way to reduce the environmental impact of silk production. Silkworm pupae meal is a protein-rich feed ingredient with a high nutritional value. Its crude protein content ranges from 50% DM to more than 80% DM (for defatted meal). The lysine (6-7% of the protein) and methionine (2-3% of the protein) contents are particularly high. However, the true protein (calculated as the sum of amino acids) in silkworms was found to correspond to only 73% of the crude protein content (Finke, 2002), which was explained by the presence of chitin, since this component contains nitrogen. However, the chitin content of pupae meal is relatively low, about 3-4% DM (Finke, 2002; Suresh et al., 2012). The presence of chitin and insoluble protein may also explain the presence of fibre, and values of 6-12% DM of ADF have been reported (Finke, 2002; Ioselevich et al., 2004). Undefatted pupae meal is rich in fat, typically in the 20-40% DM range. Defatted meal contains less than 10% oil in the DM. Silkworm oil contains a high percentage of polyunsaturated fatty acids, notably linolenic acid (18:3), with reported values ranging from 11 to 45% of the total fatty acids (Ioselevich et al., 2004; Rao, 1994; Usub et al., 2008). Compared to other animal by-products, silkworm pupae meal is relatively poor in minerals (3-10% DM). Silkworm litter appears to have an extremely variable composition, with crude protein values reported to be between 15 and 58% DM (Chen YaoWang, 1989; Patil et al., 2013). Silkworm pupae meal does not appear to contain toxic components. In poultry, notably, the mortality of birds fed diets containing silkworm meal is similar to that of animals fed more conventional protein sources (Dutta et al., 2012). Silkworm meal is a very valuable protein supplement for ruminants, due to its highly undegradable protein content and favourable amino acid profile. Limitations in its use as ruminant feed result from the high oil content. Therefore, fat extraction of silkworm meal is of interest when it is fed in large amounts (Ioselevich et al., 2004). Effective in situ nitrogen degradability of silkworm meal is quite low. Reported effective degradability values (5%/h outflow rate) for undefatted silkworm pupae were 29% and 25% (Chandrasekharaiah et al., 2002; Ioselevich et al., 2004) and 20% for defatted meal (Chandrasekharaiah et al., 2004). This results in large amounts of undegradable protein, especially from the defatted meal, which is richer in protein. Lysine and methionine, which are considered to be the two major limiting amino acids for milk production, both have a low in situ disappearance of 26% (24 h incubation, 5%/h outflow rate), which indicates that the bypass protein fractions of silkworm pupae are good sources of lysine and methionine for ruminants (Sampath et al., 2003). However, the undegradable protein fraction has a relative low intestinal protein digestibility of 53%, as estimated by in vitro pepsin-pancreatin solubility (Ioselevich et al., 2004). Undefatted silkworm meal safely replaced 33% of groundnut cake in fattening diets for Jersey calves without decreasing performance, resulting in a cheaper feed. The protein digestibility of the silkworm meal-based diet was higher than that of the groundnut cake diet (Narang et al., 1985). In lambs fed a basal diet of barley and hay (75:25), the isonitrogenous substitution of a potato protein supplement with undefatted silkworm meal resulted in similar increases in nitrogen and energy retention (Ioselevich et al., 2004). The crude protein digestibility of defatted Tussore silkworm pupae fed with wheat straw and molasses to sheep was about 70% (Khan et al., 1971). Limited information is available on the utilization of silkworm pupae for pigs. Two experiments showed that silkworm pupae meal was a good replacement for traditional protein sources. In Brazil, it was possible to replace up to 100% of soybean meal in diets for growing and finishing pigs with undefatted silkworm meal with no effect on growth performance and carcass characteristics. There was a negative effect on intake when the substitution rate was higher than 50%, which was attributed either to the higher energy density of the diet or to a lower palatability. However, the lower intake was compensated by a better feed conversion rate, which may have been due to the higher lysine content of the silkworm-based diet (Coll et al., 1992). In India, silkworm meal could fully replace fish meal in the diet of growing and finishing pigs without altering carcass and meat quality and blood parameters (Medhi, 2011; Medhi et al., 2009a; Medhi et al., 2009b). Silkworm litter can be used in pig diets. The recommended inclusion rate is about 7% and should not exceed 10% (Wang et al., 2007; Chen YaoWang, 1989). Silkworm pupae meal is a valuable protein source that can be used in poultry feeding, though it is of slightly lower quality than fish meal. High amino acid digestibilities (lysine 94%, methionine 95%) were determined in geese (Penkov et al., 2002). Unless otherwise specified, the silkworm pupae meal used in the studies cited in the tables below was not defatted, though this is not always clear from the papers or abstracts. Numerous trials have shown that replacing 50% of the main protein source (fish meal in most of the experiments) is usually safe, though mineral supplementation may be required. Total replacement is sometimes possible but tends to result in a lower performance. Inclusion rates are typically in the 5-6% range. One study indicated a growth stimulating effect in growing chicks correlated with the activity of ecdysteroid, a hormone involved in the metamorphosis of the pupae (Fagoonee, 1983a; Fagoonee, 1983b), though this has not been confirmed since. Treating deoiled silkworm meal with 70% acetone for 12 hours was shown to improve broiler performance (Venkatchalam et al., 1997). Trials in which traditional protein sources in broiler diets were replaced with silkworm meal are summarized in the table below. Silkworm meal seems to be well accepted by laying hens (Saikia et al., 1971; Joshi et al., 1979; Joshi et al., 1980) but studies are less numerous than for broilers. One study found that silkworm pupae meal was detrimental to the breeding performance of breeder males (Mahanta et al., 2004). Some of the data is summarized in the table below. Dried silkworm meal totally replaced soybean meal in balanced diets for growing rabbits without any problem (Carregal et al., 1987). 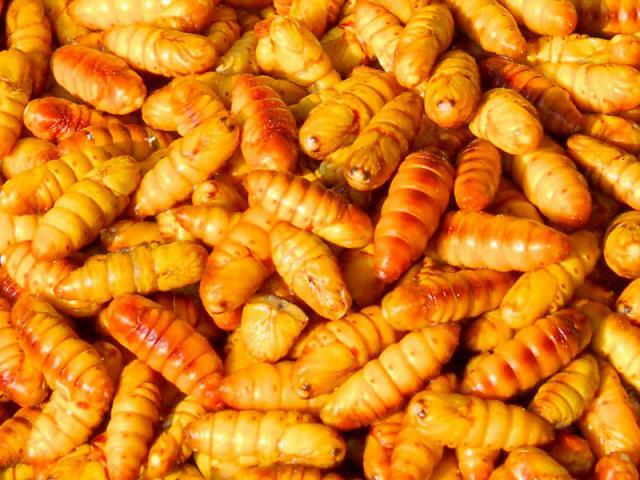 In China, silkworm meal is a traditional ingredient in rabbit feeds. In a trial evaluating a new rapeseed meal, 7% silkworm meal was included in the control diet (Liu et al., 1987). Silkworm pupae meal is a valuable protein source for many fish species. High levels of silkworm meal (about 30%) can be fed to cyprinids. When silkworm meal replaced part, or all, of the fish meal in common carp (Cyprinus carpio) diets, similar performance (growth and feed conversion) was observed (Jeyachandran et al., 1976; Erencin, 1976; Borthakur et al., 1998a; Borthakur et al., 1998b; Nandeesha et al., 1990; Nandeesha et al., 1989; Rahman et al., 1996). Undefatted silkworm pupae meal was safely used up to 50% without hampering growth and meat quality of the fish (Nandeesha et al., 2000). In a comparison between silkworm pupae meal and plant leaf meals (alfalfa and mulberry), feed conversion efficiency, nutrient digestibility and nutrient retention were better for diets based on silkworm meal than for diets based on plant leaf meals (Swamy et al., 1994). In silver barb fingerlings (Barbonymus gonionotus), highest growth rates were observed in fish fed a diet with about 38% of total dietary protein replaced by silkworm pupae meal (Mahata et al., 1994). Mahseer fingerlings (Tor khudree) fed a diet containing 50% defatted silkworm pupae at 5% body weight had better growth and survival rates than fingerlings fed no or lower amounts of silkworm pupae (Shyama et al., 1993). Fermented silkworm pupae silage or untreated fresh silkworm pupae paste were incorporated in carp feed formulations, replacing fish meal, in a polyculture system containing the Indian carp (Catla catla), mrigal carp (Cirrhinus mrigala), rohus (Labeo rohita) and silver carp (Hypophthalmichthys molitrix). Survival rate, feed conversion ratio and specific growth rate were better for fermented silkworm pupae silage than for untreated silkworm pupae or fish meal (Rangacharyulu et al., 2003). In rohu, undefatted silkworm pupae and defatted silkworm pupae produced significantly better protein digestibility values than fish meal (Hossain et al., 1997). Mozambique tilapia (Oreochromis mossambicus) were able to utilize the protein of both defatted and undefatted silkworm meal (apparent protein digestibility of 85-86%) (Hossain et al., 1992). Chum salmon fry (Onchorhynchus keta) fed over 6 week diets supplemented with 5% silkworm pupae meal at the expense of fish meal did not show improvement in growth rate and protein content, though silkworm supplementation enhanced feed efficiency (Akiyama et al., 1984). Silkworm pupae meal was used as a substitute for fish meal at up to 75% of the protein in Asian stinging catfish (Heteropneustes fossilis) diets without adverse effects on growth (Hossain et al., 1993). Undefatted silkworm pupae was found to be a suitable fish meal substitute in diets for walking catfish (Clarias batrachus). Digestibility of the crude protein in silkworm meal was found to be similar to that of fish meal (Borthakur et al., 1998a; Borthakur et al., 1998b). In Japanese sea bass (Lateolabrax japonicus), the energy digestibility of undefatted silkworm pupae meal (73%) was lower than that of poultry by-product meal, feather meal, blood meal and soybean meal, but comparable to that of meat and bone meal. Protein digestibility was also lower (85%) than that of poultry by-product meal, blood meal and soybean meal but it was comparable to that of feather meal and higher than that of meat and bone meal (Ji WenXiu et al., 2010). Shrimp growth trials showed that digestive efficiency was reduced when silkworm meal was used to replace fish meal (Sumitra-Vijayaraghavan et al., 1978). In juvenile abalones (Haliotis discus hannai Ino. ), a combination of soybean meal and silkworm pupae meal replaced fish meal, resulting in slightly higher survival rate and better growth performance (Cho SungHwoan, 2010). Sharmila, K., 2008. Effect of type of Silkworm Pupae Meal and enzyme fortification on performance lipid profile and immunological status in broilers. PhD Thesis, Karnataka Veterinary, Animal and Fisheries Sciences University, 156 p.